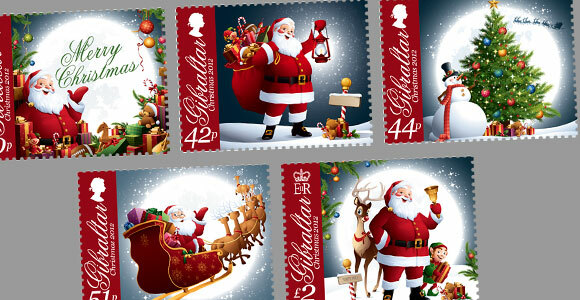 Santa Claus, Saint Nicholas, Father Christmas or Santa, is a figure with legendary, mythical, historical and folkloric origins who, in many western cultures, is said to bring gifts to the homes of the good children during the late evening and overnight hours of Christmas Eve, December 24. The modern figure was derived from the Dutch figure of Sinterklaas,which, in turn, may have part of its basis in hagiographical tales concerning the historical figure of gift giver Saint Nicholas. A nearly identical story is attributed by Greek and Byzantine folklore to Basil of Caesarea. Basil’s feast day on January 1 is considered the time of exchanging gifts in Greece. Santa Claus is generally depicted as a portly, joyous, white-bearded man wearing a red coat with white collar and cuffs, white-cuffed red trousers, and black leather belt and boots (images of him rarely have a beard with no moustache). This image became popular in the United States and Canada in the 19th century due to the significant influence of Clement Clarke Moore’s 1823 poem “A Visit From St. Nicholas” and of caricaturist and political cartoonist Thomas Nast. This image has been maintained and reinforced through song, radio, television, children’s books and films. The North American depiction of Santa Claus as it developed in the 19th and 20th century in turn influenced the modern perceptions of Father Christmas, Sinterklaas and Saint Nicholas in European culture.